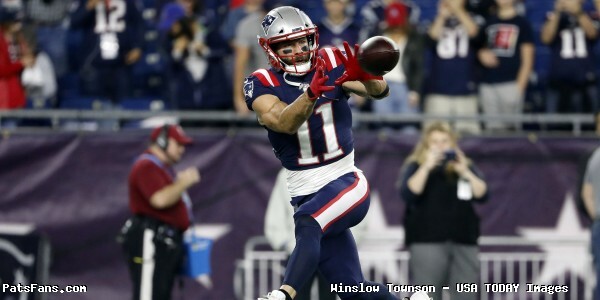 On Instagram Friday, New England Patriots wide receiver Julian Edelman shared some motivational words heading into the weekend’s matchup with the Minnesota Vikings. “No such thing as perfection, its just pursuit. #RelentlessMindset” the caption read. In seven games back with the Patriots Edelman has logged 44 receptions for 510 yards and three touchdowns. In 2016, his last full season, Edelman had three touchdowns in 16 games. Since his 2017 ACL injury that sidelined him for the entire season, Edelman has become more cognizant of his health. This past Sunday against the Jets, Edelman went airborne multiple times prompting questions about how he’s protecting himself from further injuries when he hits the turf. This entry was posted in Patriots Photos and tagged Julian Edelman on November 30, 2018 by Robert Alvarez.